May 9, 2000. While celebrating my 44th birthday my identical twin sister, Jeri Howland, herself a word class Ironman triathlete and top ranked ultra-endurance runner, encouraged me to try an XTERRA. Not wanting to directly compete against each other, the idea felt “safe”. Over the next few days I investigated XTERRA and from everything I could tell, it was a world of its own, quite different from Ironman. Half Moon Bay XTERRA on August 19, 2000, was added to my calendar. “XTERRA” means extreme dirt. In this case it refers not to the Sports Utility Vehicle manufactured by Nissan (although Nissan is the main sponsor of XTERRA triathlons), but rather to a multisport competition involving open water swimming, off-road mountain biking and rugged trail running. 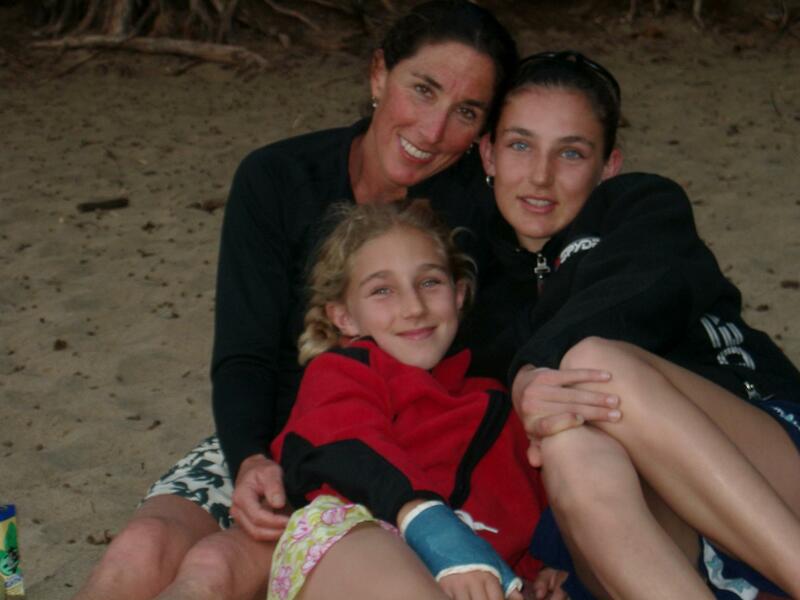 The heart of XTERRA lies in mountain biking, the sport in which I have been most involved. As one of the co-founders of N.O.R.B.A. (National Off-Road Bicycle Association, the original sanctioning body for mountain bike competition), I helped pioneer women’s mountain bike racing in the early 1980’s. In the last twenty years, I competed Expert Class in all the major Mountain Bike Series, including the N.O.R.B.A. National Series. Hence, the bike segment of XTERRA would present no issue. And for that matter, nor would the swim since I swim for an hour daily. The running portion of XTERRA was a potential problem. Having not stepped into running shoes in over twenty years, and with my first XTERRA attempt two months away, I took to the track. The running came slowly and painfully, but with determination, consistency and a lot of patience, I found my stride. Ironically, it is now the running part of the XTERRA event that sets me apart from the other competitors. Once again, if someone had told me when I was 40, that in five years I would be running speed intervals on a track and enjoying 15-mile hilly trail runs, I would have simply smiled and rolled my eyes, mumbled a “yeah right,” and turned quickly to the next topic of conversation. XTERRA has a slogan, “Where Champions are Born.” My first attempt went well given the goal was merely to finish the race. I finished strong and happy in less than 4 hours, and thrilled with my new silver medal. Champion? Not yet, but with an invitation to the XTERRA World Championships in Maui two months later, I smelled the possibilities, packed my bags and made airline reservations that night. I was hooked! The first year of XTERRA competition awarded me with a second place finish at the U.S. Championships (Half Moon Bay) and a third place at the World Championships (Maui). The next season went even better. First place at the Western Regional Championships, first place at the U.S. Championships and first place at the World Championships. I got sponsorships, newspaper write-ups, interviews on radio and in magazines and was featured on xterraplanet.com. I soon joined the XTERRA Team as an Ambassador (public relations role) and was selected as the amateur Champion to join XTERRA pro Champions at a special Xterra Media Day. This last season, my third, has just ended. My husband, two daughters and I followed the XTERRA U.S. Championships Series from east to west coast. I finished undefeated in my age group, now 45 to 49, at the Eastern, Central, Western, and U.S. Championships. The icing on the cake was an article written by Scott Schumaker about XTERRA Champions defending their titles, and within the discussion I was compared to the unbeatable professional and Olympic triathlete from South Africa, Conrad Stoltz. Grinning ear to ear upon reading this article, I realized right then and there, it’s never too late to become a champ! Needless to say, Xterra events are a major influence in my life. Life has been energized – both athletically and spiritually. Xterra has fueled my inner fire! Even though I am a devoted wife and Mom, I haven’t felt this level of passion in a long time. I live and breathe the Xterra spirit – it is with me from the moment I rise until I close my tired eyes. When I swim at 6:00 a.m. under a shining moon, I think about how “xterra-ish” it is. At 46, I am swimming faster than ever! Later, when I’m cycling midday, I try hard to “go for it” and make it an “Xterra” experience. During the winter months when we’re in the mountains every single weekend for our daughters’ ski team training, I am compelled to run in the late afternoons. This is a challenge after skiing from 8:30 a.m. until 3:00 p.m. chasing after my former ski racer husband, but I have XTERRA goals and I cannot afford to lose stamina in any of the disciplines. When I head out for an eight mile run on snow, dirt and up hills (at altitude), I’m fortified by the fact that I go with an XTERRA purpose. When I’m done and practically crawling into our cabin, I know in my heart that if there was an Xterra next week, I could go. It’s been 3 years and 10 Xterras. What has transpired is the utmost of positive experiences on every imaginable level. The Xterra experience has effected me and my family, not just by enhancing the adventure/travel/excitement dimensions of our life, but in revealing expansiveness of human character. I have learned important lessons about what raw will can produce, where spirits can soar to after being rekindled by athletic fulfillment and inspiration, and what phenomenal possibilities emerge out of setting and achieving goals. I am now equipped for what I call Xterra Life (the only life I want to live). I possess desire to go beyond the ordinary (some people aren’t lucky enough to know “going beyond” is an option). I am able to meet demands with determination, commitment and confidence. I have emotional texture and a depth of spirit that carries me to places where I am open, unafraid and energetic to conquer whatever challenges are laid out without always knowing what the course ahead might be. Finally, I understand the glorious fulfillment of digging deep for a chance at success that at this moment includes the taste of being a champion. Where to from here? The second book, entitled The Power of Exercise, will be published within the year. It is the first of a series of books on energizing life and creating success through the power of regular exercise. As for athletics, there will be many more Xterras – close to home (in the U.S.) and farther away (The Czech Republic? Australia? Saipan?) There are dreams to do a mountain bike stage race in Europe in the July 2003, but first I must find another female competitor my age, eager to partner and participate. Being a champion has certainly given me more confidence, but it is really the raw energy elicited from everyday workouts that fuels my aspirations to excel in other aspects of life. Real success is, for me, being a source of inspiration first and foremost to my daughters, and ultimately to all people.